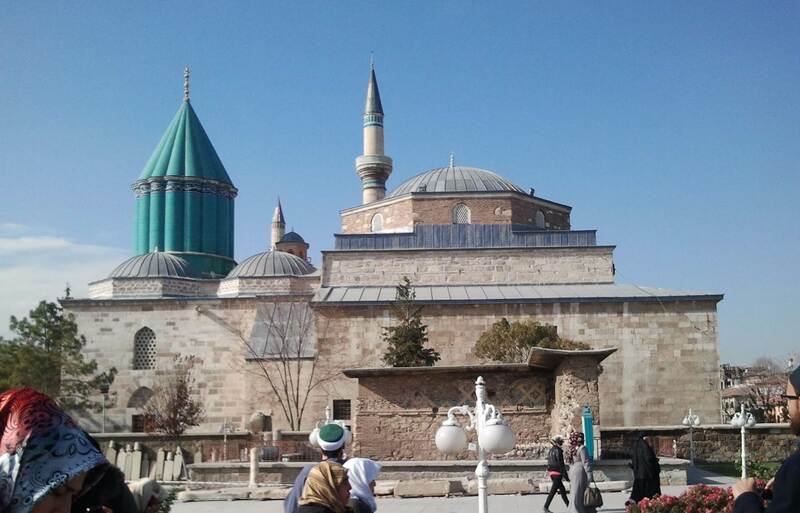 We started our rihla in Konya, the resting place of Rumi (raheemahullah alai = upon whom be Allah’s grace). Though he is popularly known as Rumi in the west, his real name is Muhammed, the son of Muhammed, the son of Ahmed = Muhammed bin Muhammed bin Ahmed. He was a recognized scholar in the classical Islamic tradition, I believe in the hanafi school. And though he is best known, especially in the western world, for the whirling dervishes and ecstatic forms of worshiping God, many of these traditions are quite possibly erroneously attributed to him. He did however write widely about cultivating love for the divine and being on a path of eradicating one’s ego, which is done by filling the heart and mind with God-consciousness. This view makes more sense to me as my understanding of Islam is that while it allows for all forms of devotion to God, it prefers that the devotee is firmly ‘grounded’ in the practical world while at the same time being always in-tune with the divine. This is why all Muslims love Muhammed (peace and blessing of God be upon him) so much, for he taught how to *live* the quran; being the best father, the best husband, the best tradesman, the best general, the best leader etc., i.e. showing how to best conduct ones worldly affairs while being the foremost in worship to God. He is exalted in our tradition as the best ‘slave’ of Allah. i.e., the one most devoted to serving God. The resting place of Rumi (raheemahullah alai) had a certain peace and feeling in the air hard to describe. In this regard I can so relate to this post by my sister. It was filled with visitors of all sorts, many who stayed to pray by his grave. This is also highly recommended to do in our tradition, to visit the graves and to pray for those who have left this world. 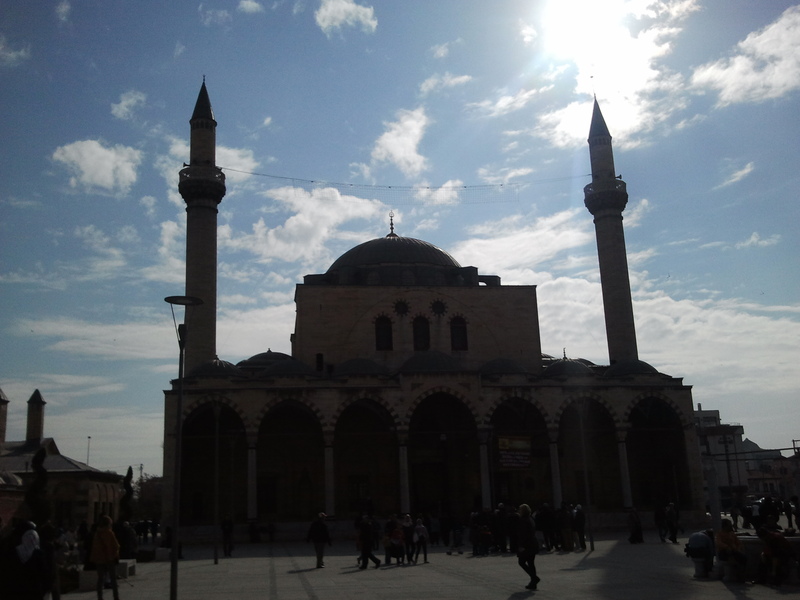 We left this place just as the adhan (call to prayer) sounded for dhuhr and made it to the mosque next door. It was a large mosque (masjid) built many centuries ago. Apparently very beautiful inside mashaAllah. I did not get to go inside as it was full, we so rushed to join the jama’ah (congregation) outside all around the masjid. It was my first experience of a jama’ah during this rihla, the first of many beautiful jama’ath (plural of jama’ah) to come. Alhamdulillah! 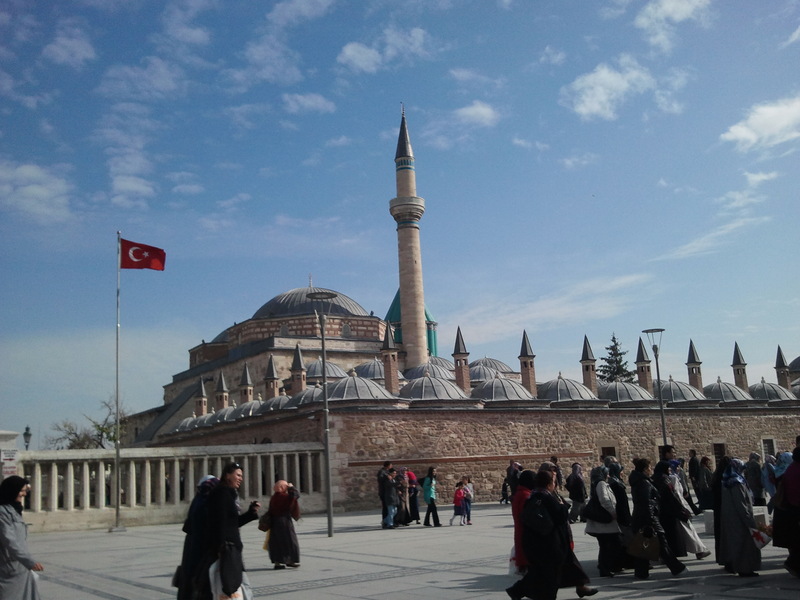 We saw much more during that one day we spent in Konya. I will mention one more place. We visited an ancient ‘madrasa’ (=school). 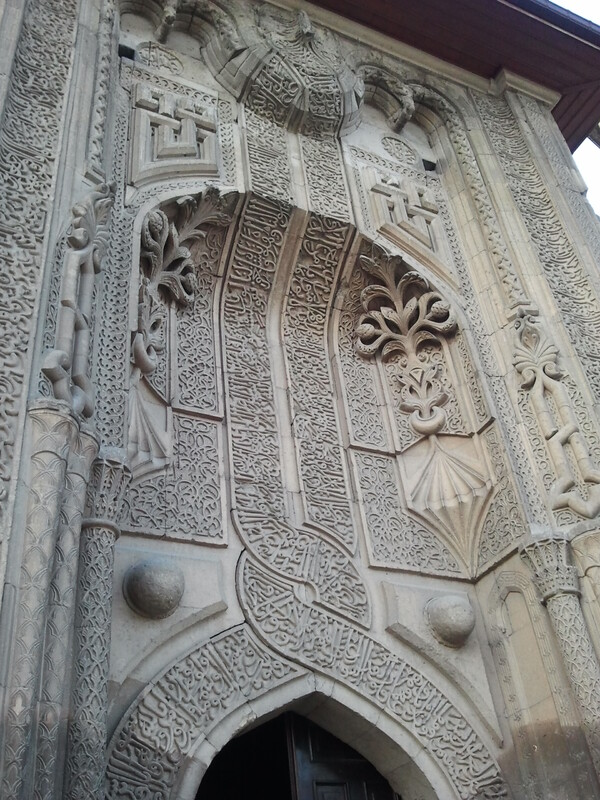 The famous Karatay madrasa, built in 1252 CE (follow the link for more information on this architectural gem). Unfortunately the word ‘madrasa’ is also now sullied with sad images of poorly run and decrepit institutions where little kids mindlessly memorize the Quran in places like Pakistan…you may know what I mean… images of boys rocking to and fro as they memorize come to mind. But I digress. 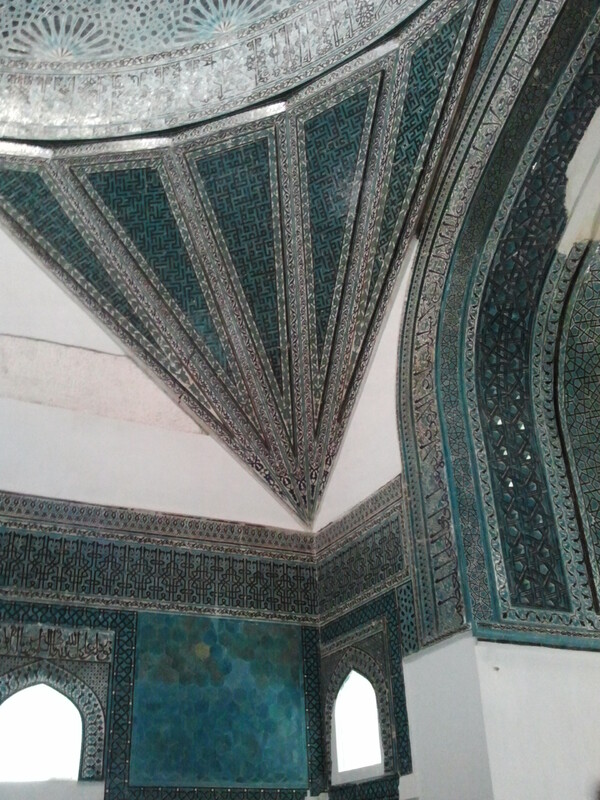 The madrasa as it was in the old Muslim world was more akin to a university combined with a boarding school. Students stayed as long as required to master certain texts, and usually an endowment (=waqf, BTW one of the longest running soup kitchens is fed by a +450 year old waqf in old Jerusalem, established by the Haseki Harrem Sultan, the wife of Sultan Sulaiman the magnificent) would fund their food and board. Much like students travel vast distances today to gain knowledge, students did the same then and many such madrassas attracted bright students from all across the world. Interestingly two of the oldest still-working universities in the world are both in the old Islamic world, both linked to strong women figures, the one established by a woman – Al-Karaouine in Morocco and the other named after one- Al-Azhar in Egypt. There is so much to be said about this madrasa. Every corner, every square foot was carefully designed with esoteric meaning and exoteric practicality. 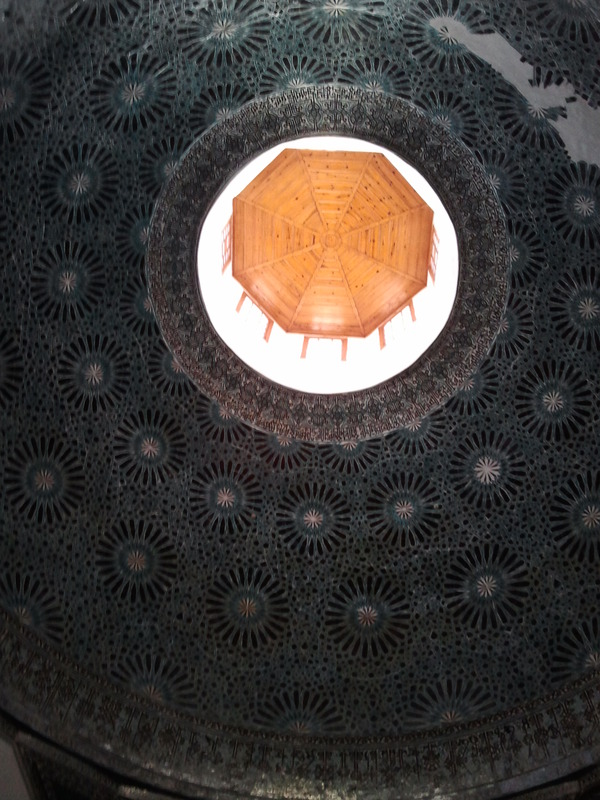 I can unfortunately only try to cover one very interesting aspect – the hole in the center of the roof in the main hall. Directly under the hole is a depression in the floor like a small pool. Apparently during the winter this pool was filled with wood and acted as a fireplace sufficient to heat the whole building – the hole then becoming a chimney. And in the summer the pool was filled with water and students would sit around it at night to observe the reflection of the stars from the hole in the roof, and this way study astronomy! This little snippet touched my heart and brought the whole room to life. This has been a lot of text, pictures below :). May this find you in a high state of good health and happiness. Peace be with you all. To end, one more picture, of a beautifully decorated entrance with ayah (= sign, each verse in the Quran is called an ayah, literally Muslims consider it to be a sign) of the Quran. Peace be with you all.